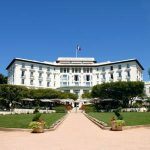 The Grand-Hôtel du Cap-Ferrat was our address for the annual Gala Dinner and Dancing. We gathered in the Volupte Garden for aperitif, followed by a gourmet dinner at the hotel’s seaside Club Dauphin. 90 guests had a wonderful evening in the utmost luxury and sophistication. We also enjoyed a quiz organized by DJ Mark Dezzani and dancing to familiar music.